The Lewiston, Idaho area. Commonly known as the LC Valley, I can search anywhere in a one hour radius from my home. I work on a ''Reward Basis'' that means you pay me what it's worth to you and what you can afford, for me to come out and find your lost item. It's not based on how long search takes, it's based on whether or not I find it. There will be a call out fee of $25 to cover my gas expense depending on where you are located... Call to discuss. I use several different types of metal detectors to search land, buildings, and shallow water. 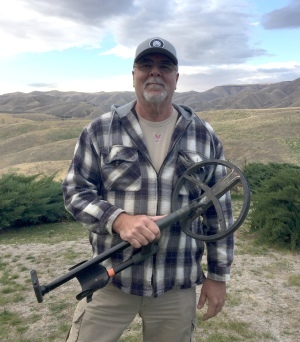 I have worked for the electric utility industry for 44 years and have been metal detecting since I was a child. My dad got me started on this craft 50+ years ago and I have been actively detecting for the last 35 years. Nothing is more rewarding to me than finding and returning items of value to my client. Smiling faces and occasional tears of joy is what this program is all about.